Even though many of these radios have 8 pin mike jacks, the 6 pin varient is perfectly suitable. Click here to buy a cable for $25. This will enter a PayPal dialog which will ask you to authorize $25 from your PayPal account, or to select to pay without a PayPal account. 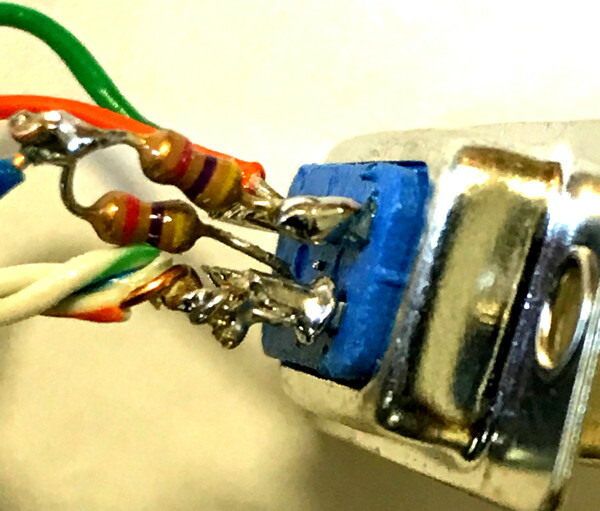 During assembly, I suggest crimping the wires to the RJ12 first, then apply heat-shrink tubing to the RJ12 end of the wire, then solder the DE9, and finally solder the 3.5mm speaker plug. These instructions create a cable idealized for the MOD-box stack. The measurements used are 12" from the RJ12 to the speaker-plug, and 9" from RJ12 to DE9. I have had very good luck with DE9 connectors and audio plugs from Parts Express. 092-158 Neutrik Rean NYS226L 3.5mm Mono Plug Nickel 0.25" Entry at 73 cents each. Try to find real copper CAT5 or CAT6 wire. I have arbitrarily selected color coding for the signals using colors available on typical CAT5 wire. I chose CAT5 wire because it is easy to crimp into an inexpensive RJ12 connector. The color codes are shown for the wires which are connected directly from the DE9 to the CAT5. Pin 1, TxData, is fed through a 4.7k resistor and then into the Blue wire. The pair of resistors allow for a much less stiff adjustment on the TNC-PI. If pin 1 was connected to the mike/txaudio wire directly, the TXLEVEL pot R7 is so sensitive that it is almost impossible to find the proper level to saturate the radio passband, without overdriving. With the addition of the two resistors in the DE9 connector, it is really easy to set R7. 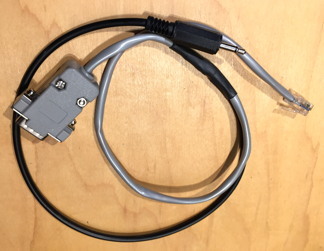 Please note that the RJ12 connector may be used even on Kenwood TK radios which have an 8-pin microphone connector. 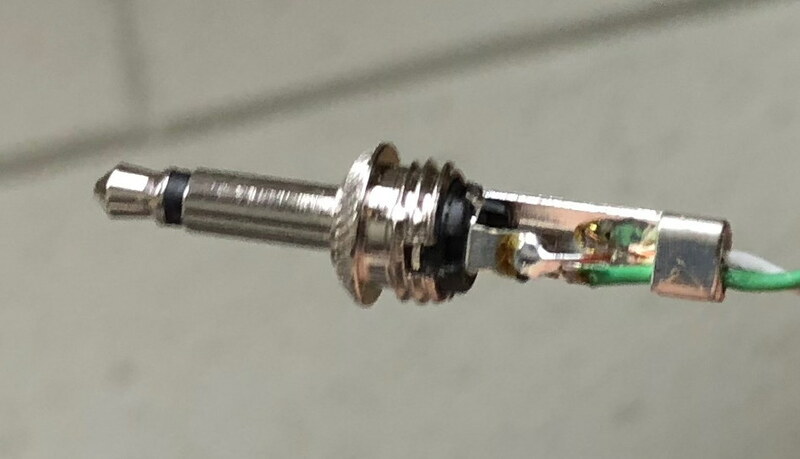 The remaining unserviced 2 pins are not used in our application or are redundant with the rear-panel 3.5mm connector. 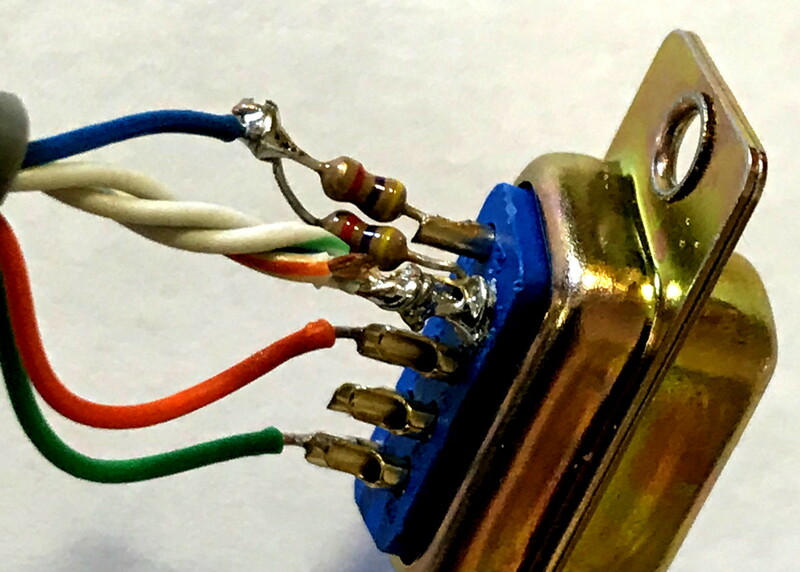 Also note that the standard Ethernet color codes were not followed and we're crimping the BROWN and BROWN/WHITE wires into the connector but not connecting them at the DE-9 end of the wire. Strip one end of the CAT5 wire such that there is about 9" of insulated CAT5 on one end, and then 12" of bare twisted wires. Now trim back the orange, brown and blue pair to 3/4". Fold the green wire back over the insulation. 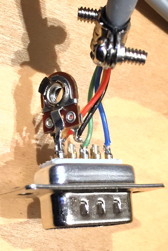 Crimp six wires into the RJ12 connector as shown, leaving the GREEN and GREEN/WHITE pair folded away from the connector. We’re connecting to 6 pins on the radio though only the middle 4 are important. Based on the image of the RJ12 just below, this is the order from left to right. Note! These wiring colors are not anybody's standard. Please crimp with these colors. 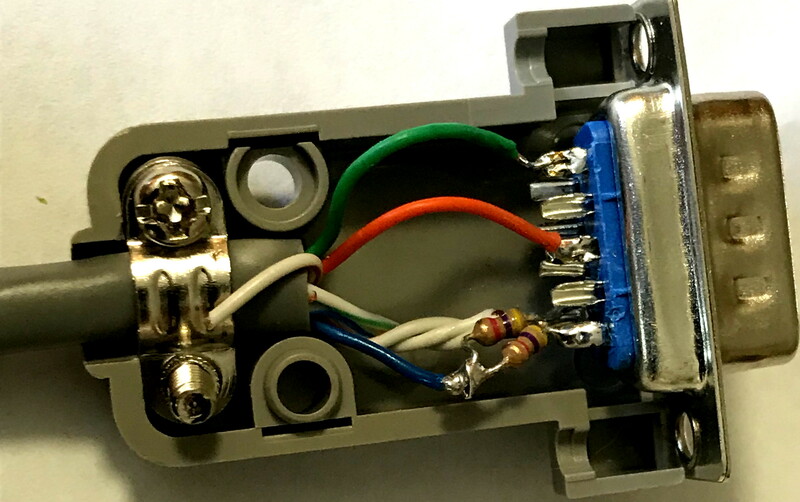 The two wires on the ends, white/brown and brown, are not important except that they make it easy to place the other four wires in the connector. 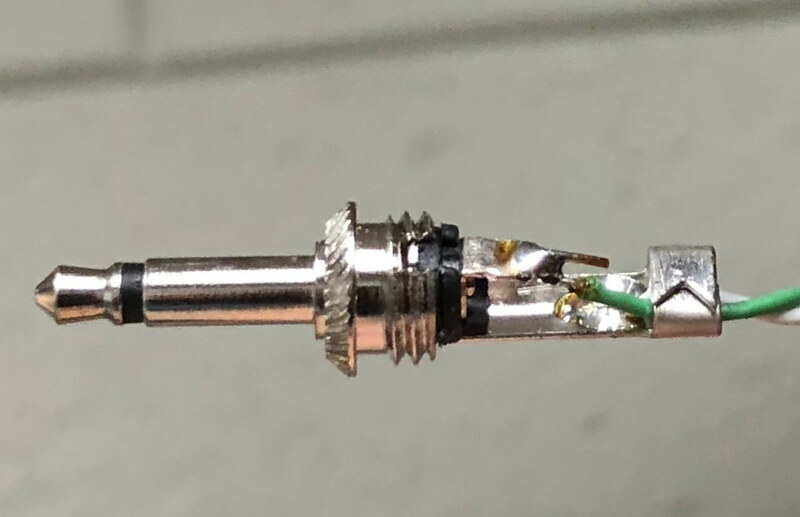 Put heat shrink over the cable over where the green wire folds back and all the way up to the connector. I found that a 2" piece of heat shrink was adequate. Strip the DE9 end of the cable back about 3/4". Unwind the pairs so you have 8 separate wires. Cut the BROWN wire back to strip point. Cut the BROWN/WHITE wire back to about 1/4" from the strip point. We're not soldering those and they contain signals we do NOT want shorted. Strip the insulation back 1/8" on the solid blue, solid green and solid orange wire. Strip the insulation back 3/8" on all of the white/color wires. Twist the stripped parts of the ground wires, GREEN/WHITE and BLUE/WHITE and ORANGE/WHITE, together. Trim, and solder the bundle of 3 wires to pin 6. Solder the Green wire to the DE9 connector pin 5 as shown at the top of this page. Solder the Orange wire to the DE9 connector pin 3 as shown at the top of this page. 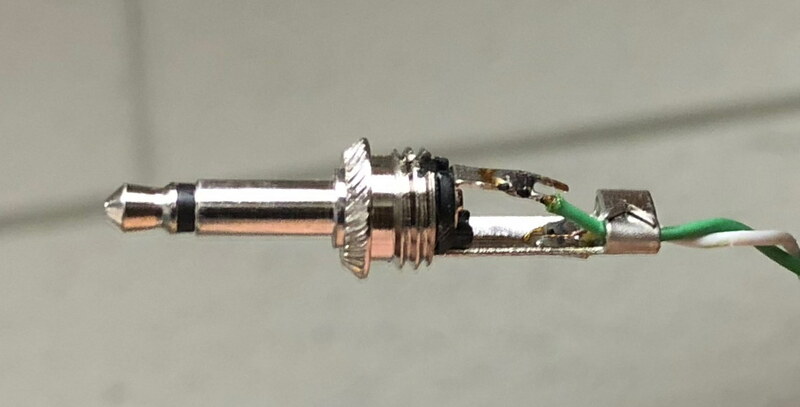 Apply solder to the twisted pair for the first 1/4" near the resistors. Cut the twisted bundle to about 1/4". Take your two resistors and cut one end of each resistor to about 1/4". Solder the two individual ends of the resistors 1-each to pin 6 ground and pin 1 TxData (pin 6 already has the twisted grounds bundle so be careful). Solder 12" long green wire to center conductor of earphone plug. Solder white&green wire to ground of earphone plug. Note that reversing these two wires on the earphone jack is the number one cause for failure of this cable! 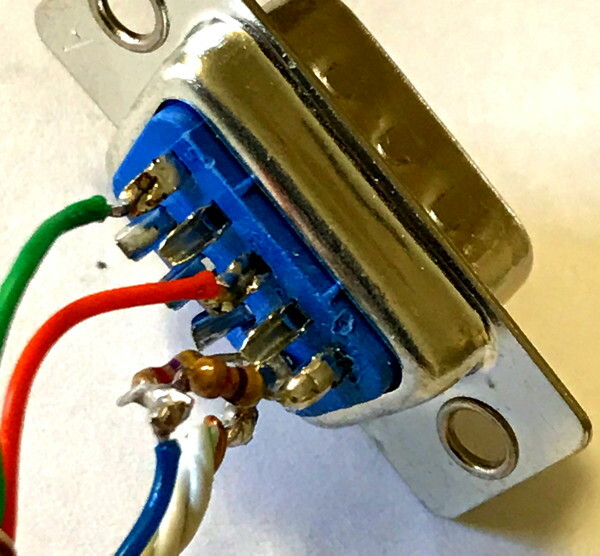 Where applicable, make sure you put the plastic insulator, spring, and screw-on cover over the wire, in the proper order and orientation, before soldering! Turn potentimeter R7 on the TNC-PI fully clockwise. Get the TNC-PI to transmit over and over by doing the Linux command tarpn linktest # where # is the neighbor-link port you are testing this cable on (not the i2c address!). Now, while listening on another radio to the braps being transmitted, adjust the potentiometer in your DE9 shell such that as you turn the transmit level left/down (sound gets softer) you turn it to where the volume just starts going down. Set it as close to (but on the low side of) the the breaking point where on one side you can tell it gets quieter, and other other side it plateaus. The point of this is that the audio level, when it is higher than some maximum, will not get louder, just more distorted. We're trying to get you to set the level near maximum, but not distorted, and it is really difficult to hear the distortion.